One year ago I wrote my Public Administration Times column on Collin Kaepernick’s “taking a knee.” Since then, some of what I stated has come true. For example, NFL team owners have joined the fray, coming down on one side or the other. It’s now time to revisit the issue. The flag is a national symbol. It reflects allegiance to the idea of American nationalism — even though we come from individual states, we believe in safeguarding the union of those states. Even rigorous states’ rights enthusiasts believe in the nation and will defend it to the death. The U.S. flag, Old Glory, is a special symbol to our nation’s top seven percent — veterans of the armed forces. Military service members take an oath of office in which they swear allegiance to the Constitution — and to the nation. One of the key words in the oath of office that links the flag to the national anthem (The Star-Spangled Banner) is allegiance. If you have ever wondered or questioned why it is professional football players who “take a knee” during the national anthem bother veterans so much, it is because veterans have taken a solemn oath to pledge allegiance to nation and nothing will ever shake that. Many veterans have fought hard for that flag — the symbol of national allegiance and we think those actions are a lot more powerful and impactful than donning a uniform and playing a sports game. I’ve often told my students I can argue any side of an issue — and should. This allows us to clarify why people do the things they do or say the things they say. 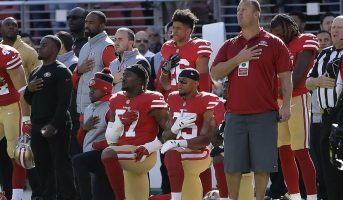 Let’s take the other side of the coin: NFL players say (more or less) they are protesting racial inequality in the U.S. and/or mistreatment of African Americans by police. They also mix in notions of solidarity with the social movement Black Lives Matter. Others who are silent player-protestors do so because they wish to have solidarity with each other. Kaepernick said he can’t stand for a country which oppresses black people and people of color. They all have chosen a method of protest that affords maximum visibility, impact and reach. When challenged about their protest method, they claim they love their country as much as anyone else and they simply want to raise the awareness level of viewers about these social injustices. They mean no disrespect, they assert, to any veteran or to the nation at large. Some say they owe it to their teammates to perform such a protest because they want to appear as an entire team together in spirit. John Ben Shepperd, former Attorney General of Texas used to say in the 1950s, “Show me a man with no identifiable stand on a clear-cut issue, and I’ll show you a man with no identifiable character or value to his community. You can try so hard to stay away from the pro and the con that you become blind to the right and the wrong.” Well, in that vein, I choose to stand with those who believe there is more harm in the football players’ action than good. That these actions constitute significant damage to the fabric of our great nation – complete with all its faults and imperfections. Social injustice exists – we can and should try to rectify instances of it wherever they are. There are plenty of Americans, conservatives and liberals, who would better appreciate their protest if it didn’t cause them to wince because it flies in the face of those who served our country. It blinds us to the protest message. Having said that, I believe these football players have the right to protest in ways they choose — but many Americans attend or watch NFL football games to do just that — see good football. They don’t go to hear or see political protest. I still find their chosen way of protest abhorrent to all that I believe and stand for. Like them, I have the right to disagree. We can disagree and still be together as one great American team. That’s how we will endure now and in the future. As a veteran, I am still a social injustice warrior. If their actions are due to simple ignorance, we can fix that by teaching them about what the flag stands for and ways to respect our nation and its veterans. We have rights and responsibilities as Americans — both are equal in importance with respect to our behaviors. Once we begin to believe our rights eclipse all other things, we are headed for trouble. The kneeling fad may subside over time but the issues remain. We should all be social injustice warriors. We should all choose how and when to make our personal stands — and accept the reaction to our action. And we should all be great Americans together. Kneeling during the national anthem offends some peoples’ feelings. The sport of football, on the other hand, inflicts untold brain damage, not to mention other injuries, the results of which extend far beyond those who play the game. Those who think the former activity harms our society might want to ask themselves if the game itself is ethically viable.